The Scotch Malt Whisky Society has been named Independent Bottler of the Year in Whisky Magazine’s prestigious Independent Bottlers’ Challenge (IBC) competition. The SMWS has concluded a wonderful year of recognition for its single cask, single malts by winning the title of Independent Bottler of the Year in Whisky Magazine’s Independent Bottlers’ Challenge competition. The Society also won the awards for Independent Bottler of the Year for Campbeltown, Speyside and Grain whiskies. The IBC award demonstrates the extremely important role that independent bottlers play within the whisky industry, offering consumers expressions from distilleries where ‘house’ bottlings are rare or non-existent, as well as single cask and limited-edition releases at unusual ages and a range of strengths. The Independent Bottler of the Year award concludes an extremely successful year for the Society, with a suite of prizes in a range of international competitions, including The Luxury Masters awards, the IWSC, International Spirits Challenge, the San Francisco World Spirits Competition, the Ultimate Spirits Challenge, and the Scotch Whisky Masters. 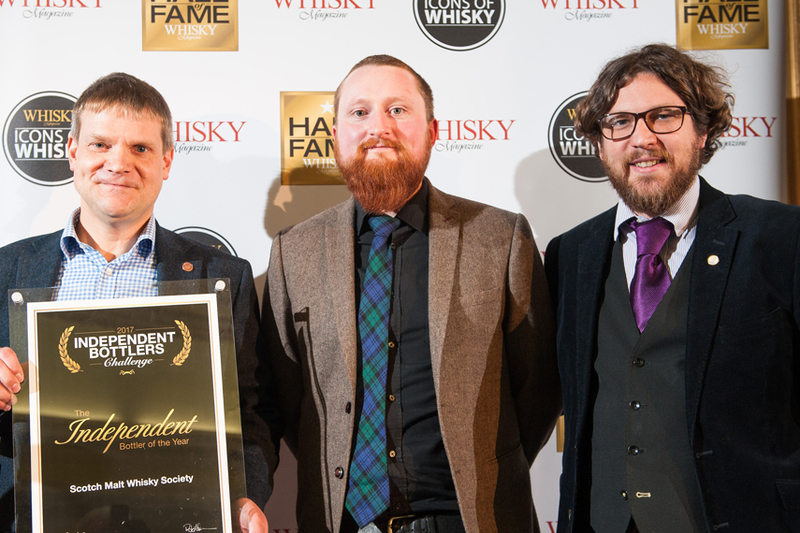 “This year has been one of the busiest and most successful in The Scotch Malt Whisky Society’s history, and winning the overall title of Independent Bottler of the Year is fantastic recognition of the outstanding quality of the whisky we offer our members,” said Kai Ivalo, spirits director at the SMWS. “We go to great lengths to source for our members the very best casks from a wide range of distilleries and offer a huge variety of bottlings in our monthly Outturns. To access the Society’s award-winning whiskies, join now by visiting the website. A list of all the bottles that helped the Society win the title of Independent Bottler of the Year 2017 can be accessed here. Pictured above: Kai Ivalo & Euan Campbell accepting the award from Rob Allanson, editor of Whisky Magazine.